Your course completion certificate will note the tracks and courses you have completed. Alumni can purchase partial tracks if they have completed the other courses in the track as part of prior training with us. 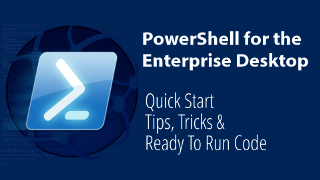 It is a getting started course chock full of important details and ready-to-run code samples to help you start using PowerShell on the Enterprise Desktop. Schedule: 24 Hours a day at your desktop anywhere on the planet. 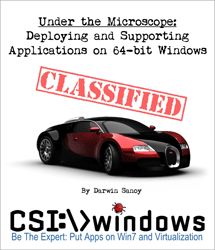 CSI-470 is the App-V training that teaches you how to sequence applications, including critical background on how applications integrate into Windows and how to capture setups. The fifth day covers InstallShield AdminStudio's App-V Assistant. This track teaches usage, debugging, auditing and management of the Windows Shim Infrastructure. This includes Microsoft's Compatibility Administrator, the Program Compatibility Assistant (PCA) and the Windows 7 Compatibility Assistant. The course covers everything needed to get started with shimming and focuses on shims for running applications under non-admin accounts. Our traditional DesktopEngineer.com Windows Installer Packaging track has been a favorite among administrators for years. Even if you are planning to virtualize applications, this course applies to the 25% or more of applications that will not be able to be virtualized.